As a parent you may have questions about your newborn baby or child if you notice deformities in the skull. To help address your concerns, we have provided a number of articles and resource materials here. Take a moment to review the information about plagiocephaly helmets and treatment methods. 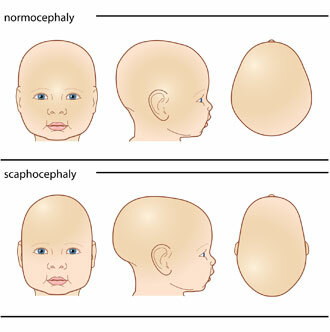 It is perfectly normal for your newborn baby to have an abnormal head shape. It should resolve over time. If not, some intervention may be required. For more information, please contact the professionals at Appletree Orthotic Services at 905-631-1616. Parents often notice mild deformities in their babies’ skulls and naturally begin to worry. Is this normal? Is this a problem? What do we do about it? Will this go away on its own? It is perfectly normal for your newborn baby to have an abnormal head shape. Abnormal head shapes caused by the birth process should begin to resolve over time, within a few weeks. However, if any flat spots or abnormal shaping are still apparent, some intervention may be required to correct the problem. Look down upon your baby’s head from above and compare what you see to the diagrams below. Your baby’s head shape will likely approximate one of the shapes in our diagram. If it tends toward any but the normocephaly, you should meet and discuss your concerns with your pediatrician, or contact us directly for a free consultation. It is important to diagnose the issue immediately, so that treatment options are implemented at the optimal stage of growth. Timing can be crucial: infants grow most rapidly in their early months and typically grow more slowly after 8 months. Let nature take her course – Many cases of abnormal head shape resolve on their own without need of any intervention other than trying to keep your baby from spending too much time in one position. 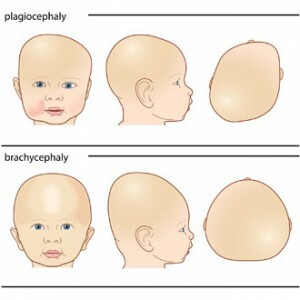 Excessive time spent in a car carrier or being left on their backs in a crib can lead to head shape abnormalities. The best way to compensate for the hours your baby spends on his or her back is to spend some quality “tummy time”. Tummy Time – Provides parents with ideas and activities to make sure your baby gets enough time on his/her tummy throughout the day, while he/she is awake and supervised. These activities include handling, carrying, diapering, positioning, feeding and playing with your baby. Click here for some Tummy Time tips. STARband – Appletree specializes in corrective helmet therapy for infants who present with deformational plagiocephaly utilizing the STARband helmet from Orthomerica. They are worn 18-23 hours per day and the duration of treatment averages 3 to 4 months depending on the age and rate of growth of the child. These helmets are commonly prescribed and very successful in treating plagiocephaly. Please keep in mind the corrective time period – between 4 months and 12 months. That is the optimum age for correcting the effects of Plagiocephaly, Brachycephaly or Scaphocephaly with a cranial remolding helmet such as the STARband. Since 2001, infants have been successfully treated with the STARband. Once you have a diagnosis from a medical professional, and the recommendation for an Orthotic helmet, bring your baby in for an initial evaluation by our specialists. We will conduct a thorough examination. Appletree Orthotics is equipped with it’s own state-of-the-art STARscanner. Using digital technology, we will create a perfect image of the current shape of your baby’s head. This baseline image will allow us to optimize your custom STARband, and track treatment progress. The STARscanner is fast and accurate, while still comfortable for your child. This makes it the assessment tool of choice for top hospitals around the world, including Sick Kids Hospital in Toronto. Following the scan, we will create a custom helmet for your child. You can also choose from a variety of colors and patterns to individualize your STARband and make it special. When the helmet is ready, it’s time for careful custom fitting. Together, we’ll develop a treatment plan for you to follow. A regular schedule of follow-ups will be established to monitor your baby’s progress. We’ll make adjustments to your STARband from time to time as your baby grows. Click here for a complete Caregiver’s Guide. Around five months of age, we started to notice our son’s head becoming flat in the back on the left side. Lucas continually favored his left side while lying down and also while in his swing, car seat and bouncy seat. When we voiced our concerns to our pediatrician, she referred us to a neurologist specializing in pediatrics. After the initial exam, the neurologist prescribed a STARband cranial remolding orthosis. We were concerned that Lucas would not tolerate wearing a helmet for 23 hours a day for 3 months. We were also concerned as his parents, how the stigma of Lucas wearing a helmet would affect us. We recognized the need for him to wear the helmet and knew it was the right thing to do in order for his head to form properly. Our concerns quickly subsided when we met an orthotist who worked directly with Orthomerica, the manufacturer of the STARband. Everyone involved made us feel comfortable and answered any questions we had. They were especially nice and gentle to Lucas during the fitting process. After just a few outings with Lucas wearing his new “jungle print helmet”, we were no longer concerned with how people would react. STARband did not bother Lucas. From the first time he put it on, he never tried to take it off and he was quickly wearing it 23 hours a day with no problems. Right away, we decided as a family that we would be dedicated to following the program. After three months of wearing the STARband, we were so very pleased when the neurologist told us that Lucas’ head was corrected, and he no longer needed to wear it. Now at almost eight months old, no one would know that he had a problem with his head. As a pediatric nurse, I am well aware of the benefits of early intervention. As a mother, I understand the concerns parents face in caring for a child with this condition. Thanks to our orthotist and Orthomerica for making our experience a pleasurable one.